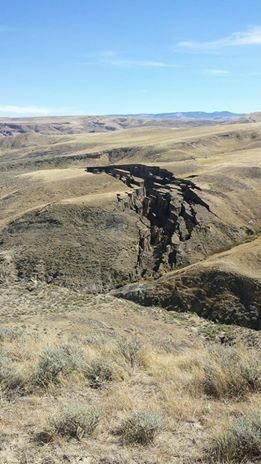 A crack in the Earth has opened up in Wyoming. A crack. In the Earth. Excuse the pun, but let that sink in for a second. A crack in the Earth. It’s over 700 meters long and about 50 meters wide. That’s a pretty big crack. It puts those sinkholes in Florida swallowing cars to shame. This thing is big enough to swallow a train. Scientists say that it’s no big deal. But it’s over 700 meters long and almost 50 wide. That makes it a very big hole in the ground, at the very least. And, it’s a crack in the Earth. It’s perfectly natural geological behavior, the scientists say. Yeah, so are ice ages but we didn’t just see one open up yesterday. Happens all the time, scientists say. Well, maybe in Wyoming. I never saw anything in Iowa like that. Or the Czech Republic. And, it’s the Wyoming thing that has to give us pause for concern. That’s where Yellowstone is. The Yellowstone supervolcano. That’s some end of the the world stuff, right there. Wasn’t there an old movie called a crack in the Earth? I don’t remember why they made the first crack, probably an oil well, I just remember that the good looking young scientist who was in love with the girl warned against it, but the sleazy, older scientist said “Nah, nothing to worry about, go enjoy your weekend” and then he went ahead and did it and there was massive disruption around the whole world, and they had to drill a hot on the other side of the Earth to keep it even. I just hope int doesn’t come to that.